We designed a very lovely version of the traditional sweetheart's scrimshaw ring. Our Handcrafted Fossil Ivory Double Bead Scrimshaw Ring is very graceful - either scrimshawed or plain. 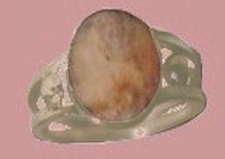 The Fossil Ivory, fully backed and bezeled, is set beside two handmade beads on twin ring shanks. You will love wearing this ring! Perfect for everyday. Choose your Fossil Ivory size and shape either scrimshawed or plain from the selection shown below. If scrimshawed, choose your hand-etched design from either a nautical theme or flowers, and have it etched on any of our ivory shapes and types. Shown in Sterling Silver with a simple bezel around unscrimshawed Crystalline Brown Fossil Walrus Ivory. Of course, handcrafted right here in our studio! Available in 14 KT Solid Yellow Gold below. Available Fossil Ivory types and colors are shown below. Ancient Ivories Studios handcrafted items make sensational and warmly personalized holiday gifts that will be appreciated by all of your loved ones. Please bookmark our site. We add new designs and items biweekly. The available colors of our high quality Fossilized Ivories are shown above. Our wonderful Ivories have been reclaimed from the ground after sharing the earth for up to 30 millennia! Even after all this time, Fossil Ivory remains warm and sensuous organic ivory; it is not petrified. It has developed its beautiful colors by taking up minerals from the earth and these colors are impossible to match in any contemporary ivories by modern processes. In time, the Fossil Ivories you wear or use will take on very personal hues from your contact. They will become a part of you. Our pieces are unique treasures created especially for the prospective wearer. Want to help us design your scrimshaw piece? Whether it's a fossil ivory Amulet or Talisman, Scrimshaw jewelry, personalized scrimshaw knife, Fossil Ivory Wedding or Commitment Band, Pendant, Brooch, scrimshaw sailor's Knife, Sterling Silver and scrimshaw Box, Scrimshaw Sperm Whale Teeth, or Sterling Silver and Ivory scrimshaw Spoons and Tableware, just email us and we will work with you for a very personal piece you'll love to use or wear!